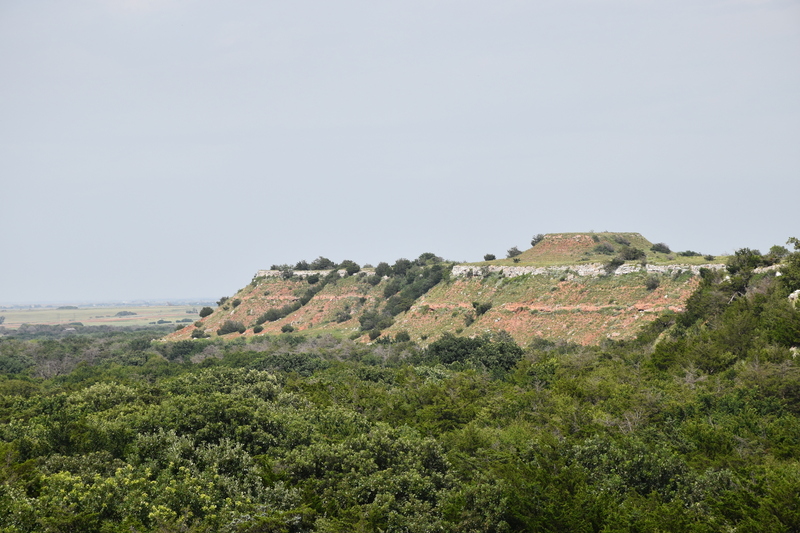 On day seven of a 37-day road trip near Watonga, OK, I stopped by Roman Nose State Park to camp - anything works better than driving all day. 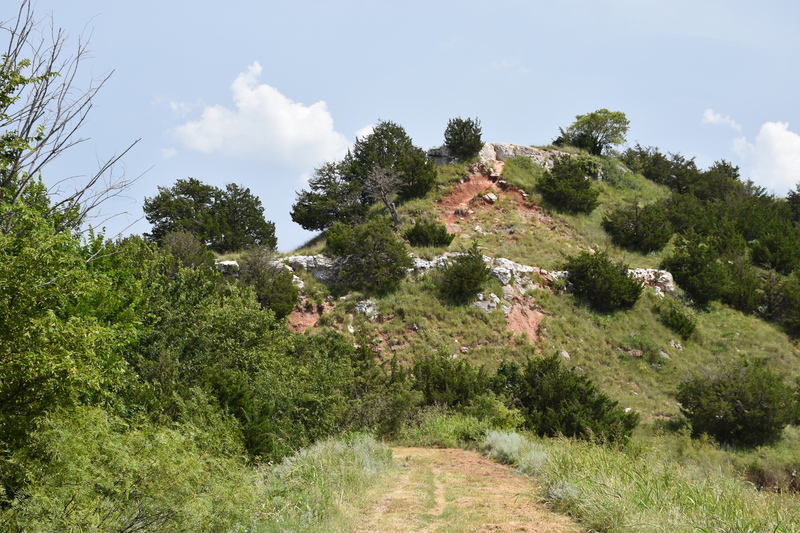 There are several trails near the Watonga Lake campground and hiking seemed like the thing to do even though it was easily 100℉ or more. I loaded my pack and walked to the Lake Loop trailhead located near the campground. Mesa and Shoreline Loop trails. The trailhead starts out with an easy incline then levels out as it gets closer to the lake. I kept an eye out for ways to depart the flat double track and climb a nearby Mesa. As the trails circles the northeast side of the lake, you will find paths that lead to a somewhat challenging scramble which leads to the mesa top. I think this is part of the Mesa Loop Trail called and the top is referred to as Inspiration Point. At any rate, it is worth the effort. A good path leading to the Mesa. 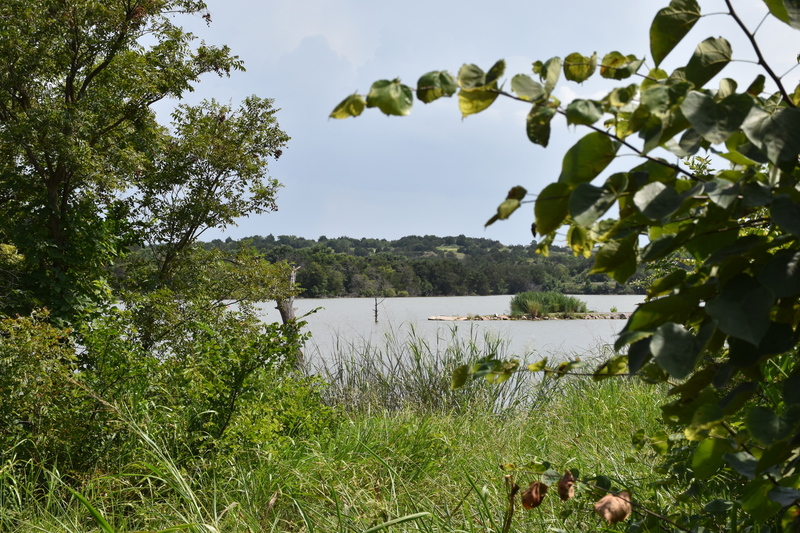 It makes sense to mix up the routes here and venture on to the connecting the trails if you are comfortable winging it - the Lake Loop Trail needs a little spice. It isn't too difficult to know where you are relative to where you need to be and the climb adds a challenge where there wasn't one before. I hiked along the mesa top until I found a way down near the southeast part of the lake. A view from the mesa top - as you can see the Lake Loop Trail is a fairly boring double track. Once you descend the mesa, the trail turns into more of a forest hike which you might like while hiking the summers in Oklahoma. However, this was about the time I was compeletely out of water and needed to find a way back. I was a little concerned about heat related problems because they come on quick and I was suffering a bit. Be careful out there! Another nearby mesa that might be worth the hike. I continued around the lake but this part of the trail can become confusing as you can't see much to help guide you especially if you depart the normal path. I had to backtrack a few times making sure not to get to out of whack. 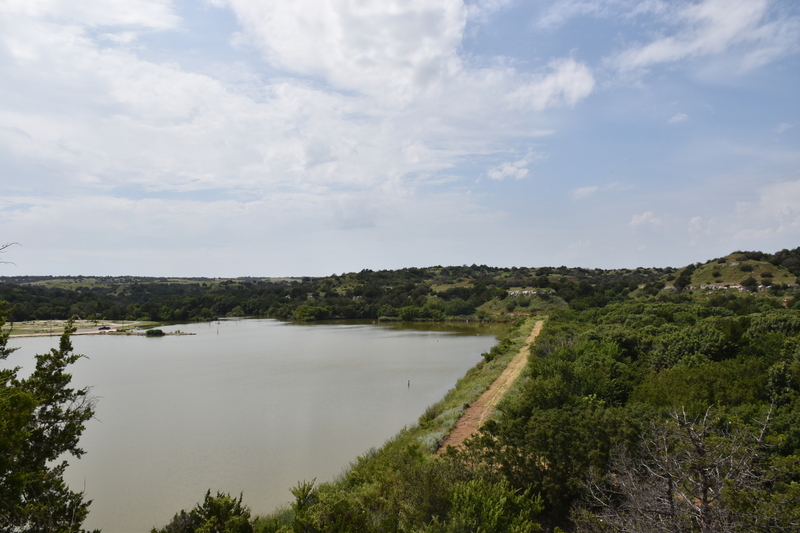 The trail eventually takes you to the east side of Watonga Lake. You could continue on to other sections or blaze a path somewhere but I had been out for a few hours and need to resupply my water. Even though it was super hot, in fact, the heat brings on a level of difficultness that makes this trail system more of a workout than you think, I enjoyed the hike. It is only a few miles, but add in the climbs and it can be a challenging task. Check it out if you find yourself traveling cross country and need to break up the 'plain' states. Nearing the end - after descending the mesa - I see my way back.